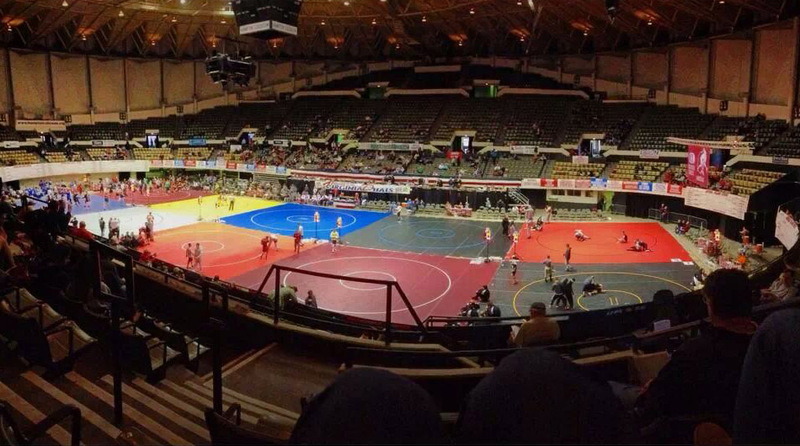 Hampton Coliseum and the Virginia Duals has become a wrestling tradition. If you enjoy wrestling then you need to pencil in The Virginia Duals on your calendar each year. January 9-10, 2015 is the date for next year’s event. Since 2007 the Fauquier wrestling team has traveled to the VA Duals to show that Fauquier wrestling can compete nationwide and showcase their talent. The 34th Virginia Duals at Hampton goes out and brings in colleges and high school teams from the eastern seaboard. Twenty two college teams and forty eight high schools make up this event. The Virginia Duals divides teams into two different college divisions and three different high school divisions where they all compete in a dual format setting. You win, you move forward; you lose and the whole team slides into the consolations. Even if you get the butterflies for being on center stage and in front of thousands, team Fauquier was not intimidated. Wrestling in the Black and Blue division for the third year in a row, it was time for team Fauquier to take control of the microphone and make some racket. It was not long until the tournament announcer calls out and reference team status many times over during this two day event. Words like, “there's a possibility pin down on mat number ten” to the eruption of the crowds that cheered for their teams. Hampton Coliseum is a place like no other venue. Or, one could look at the bottom of a match results on trackwrestling.com and will find that matches box scores reported and read lines of unsportsmanlike conduct with deduction of point(s)-from coaches and players. No need to discuss each of these crazy moments here as the volume would be too massive to review all of them. Again we are talking about the sport of wrestling where great battles are occurring and at the highest level-The Granddaddy of them all. The passion of winning at the Virginia Duals drives and twists the innersole as coaches and wrestlers pull out all stops to show what they have in their bag of tricks. A numbing feeling or that wow factor which occurs in each of the 20 teams, wrestling through each round. This is more than a common chess match for the coaches but a time to prove that you need to boost your game higher than ever before. 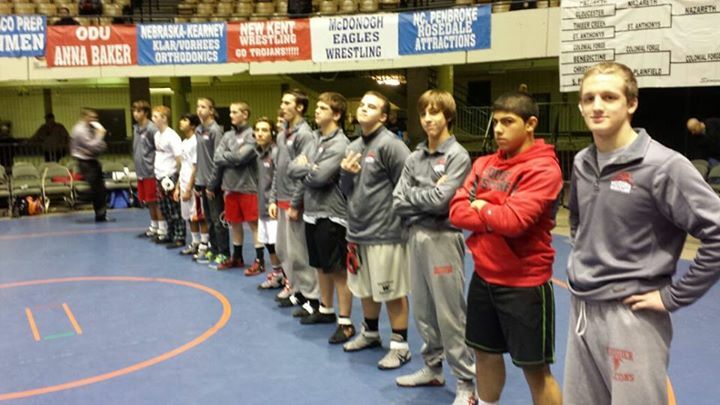 The top five moments for team Fauquier at the 2014 Virginia Duals. 1. Matt Raines earning five pins with four of the falls occurring in the first period while the other only taking 32 seconds into the second period. One of the most Outstanding Wrestlers for Team Fauquier at the Duals. 2. Clifford Harrison earning a 11-10 win over Walter Carlson of Chantilly HS. Carson a state runner-up from a year ago as Clifford jumped out to an early lead in the match as both wrestlers showed good sportsmanship that had Clifford squeaking out this close win. 3. Tyler Devers winning over Gavin Williams of Grassfield HS. with a Fall in 48 seconds. Not only was this Devers first pin of the season and wrestling up a weight class from 195 to 220lbs, this win brought team Fauquier score up to 31 heading into the final match and just five points from a tie score verse Grassfield HS. The team needed a pin at this moment as Devers came through. 4. Fauquier defeated Grafton 69-0 in round one. This is the first time in four years that Fauquier has shut out any team. 5. Garrett Tingen going 5-0 with 4 pins and a technical fall, and Daniel Ariola also going 5-0. Two alumni of Fauquier Chris Moon (Virginia Tech) and Gregory Flournoy (George Mason) also wrestled at the Duals as Fauquier Nation were able to witness them grasping out college wins for their State teams only added excitement to the experience. To have both Moon and Flournoy go 4-0 through the first two rounds of the National College Division. Then backing it up with team Fauquier rolling through both Grafton HS 62 - 0 in round one and Smithfield HS. 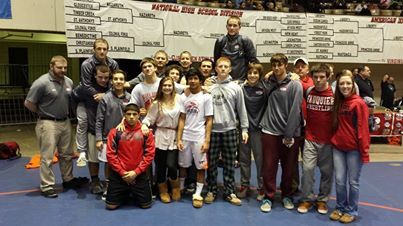 42 - 34 in their second round, after day one Fauquier Nation was on the right track. Fauquier striving to return to the Va. Duals finals as they did in 2011 they suffered a second day Semi-Finals loss to the number third seeded Chantilly HS. 45 - 25. Posting a 6 wins and 7 individual loses, team Fauquier came out of the gates flat. Fisher addressing his concern with the team shortly afterward the match was over as the team then slid onto the consolation side. With a re-focus and attitude adjustment, Fauquier then came back strong to earn a win over Centreville HS. 50-20. Team recorded 10 individual wins with 2 pins in this Consolation Semi-Finals round as they advanced to the Final Championship round. The final and last round of the Virginia Duals you have the top four teams from each of the five divisions wrestling for the final four placements. All ten wrestling mats on the coliseum floor would display the best teams in each division as most matches tend to be very close. With Fauquier 285 lb wrestler Justin Sanker suffering an injury as a result of unsportsmanlike conduct move during the Consolation Semi Final match, Sanker was held back from participating in this last match, where Fauquier was aligned to take on one of Virginia Beach powerhouse teams Grassfield HS for third place. As the score rest at 36-31 going into the heavy weight match Coach Doug Fisher may have wanted to express some anger for not having his starting heavyweight (Sanker) in the lineup. Coach Fisher had to be creative and make for some adjustments once again. In Fauquier final match verse Grassfield HS., Coach Fisher took the approach to move the final two wrestlers up a weight class for a better match up for team Fauquier-as this approached almost paid off. With Tyler Devers earning a fall at 220 lbs, Sophomore Thomas Palmer who normally wrestles the 220 lbs weight class was then delegated to the 285 lbs weight class. As Fauquier focus was to finish strong and capturing the third place trophy it came down to the heavy weight bout between Warren Cullen of Grassfield and Thomas Palmer. Palmer had no time to hesitate as he came out strong in the second period and took the lead 1-0. Going into the third period both wrestlers battling on their feet and just with seconds until the end the match, Grassfield-Cullen was able to defend one of Palmers takedown attempt to defeat Thomas and team Fauquier to a 39-31 loss. Hard to swallow as both teams cheered after witnessing a well played out wrestling final match. Not in favor of Fauquier but moments like these that become frozen in time-the last second shell to win the game. Palmer went for broke for the team win verse simply being happy with the individual win. I am sure if Thomas Palmer had won this match, it very well may have stood alone at the top moments at the Duals but maybe next time. Q: What has your experience like this year wrestling in the Black and Blue Division of Virginia Duals and getting back the final championship round? Fisher: I was really pleased with how almost all the guys responded when I asked them to bump up a weight in our second dual. It made the difference in the match outcome. I was also pleased with how we responded after our first loss in the tournament. They came back with renewed intensity, and subsequently put a hammering on a solid Centerville team. Q: Matt Raines wrestled five matches and earned five pins as his pins where almost equivalent to a 6 minute match. He had a great weekend at the Duals and any thoughts on his performance? Fisher: He just continues to improve every day. He has always been the most technical wrestler on our team, but I have previously challenged him to be more aggressive and physical, and he has responded accordingly. These results are simply the realization of his efforts. Q: The Consolation Semi-Final vs. Grassfield HS. was a tough loss any thoughts? Fisher: It was certainly a close loss. We were stretched a little thin going in giving up a forfeit at 106, and also not having Justin in the lineup. Grassfield has a bunch of very tough physical kids, and we beat many of them. Where we lost, it was not because of a lack of effort, and we refused to give up the pins that we previously did in our match against Chantilly. Overall I was pleased with their performance, and one can’t use team score as the measure of performance. Q: Heading in to the duals season can Fauquier continue to improve or make adjustments to win these close matches? Fisher: We will be really working one on one with the guys these next couple weeks, and improving their specific game, and we will be continuing working on some of our team weaknesses, and that will go a long way to helping us in those close dual meets. Life on the wrestling mat will change for team Fauquier as they enter the next three weeks. Again the Virginia Duals is one of the many high level wrestling events that Fauquier attends which mental prepares you for the next chapter in the season. With Conference play and District matches forthcoming, team Fauquier still will be faced with a few more high level teams. Fauquier now rests with a 6-3 dual meet record for the season. They will host the Conference duals next weekend Jan., 18th with six teams getting 5 matches. Scheduling update: Fauquier will be traveling to Robinson HS for a tri-match with Robinson and Chantilly on Jan. 29. Time: TBA as more details will be posted. Round Notes: Fauquier went 6-6 with 3 pins. Round Notes: Fauquier went 10-3 with 2 pins. Round Notes: Fauquier went 6-7 with 2 pins. Round Notes: Fauquier went 7-6 with 7 pins.